I’ve always marveled at the perfect orange segments that sit atop food at fancy restaurants. 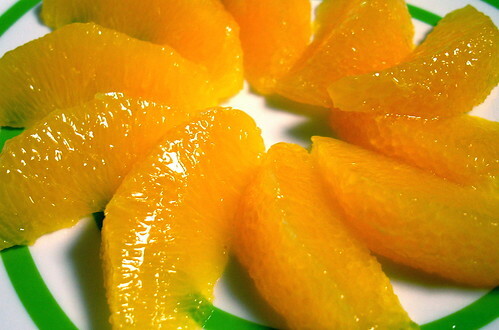 They are wonderfully juicy and don’t have a hint of rind, pith, or skin on them. 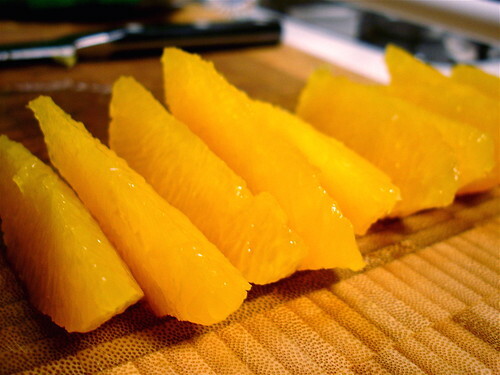 The technique that produces these pretty slices is easy, provided you have a sharp knife and a few extra minutes. You should see the divisions between each segment as little white lines. 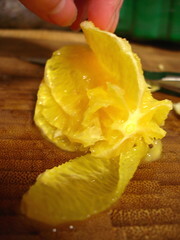 Use the length of your knife (not the point) to slice in towards the center of the orange, as close to the membrane as possible. Stop when you reach the end of the segment – you should feel resistance when you get there. Repeat the process for the other side of the segment. 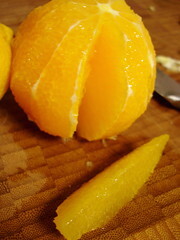 You might need to turn the knife towards the middle of the segment to release it from the orange. You should now have a perfect wedge. 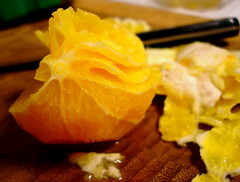 Repeat for all the segments, working your way around the orange, folding the empty membranes back under your had as you go. You should just have the orange membranes left over. Be sure to squeeze this for the juice before you toss it. 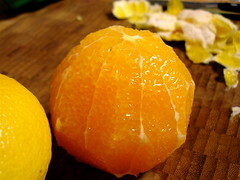 Perfect orange segments. That wasn’t that hard, was it? this is an exceptional food blog. i read all the way back, and you’ve really grown into a format and work it well. huh? I just stumbled across your beautiful blog here! Very nice work..
Great job! I’m linking to this so people can see exactly how this is done for my, deep breath, Roasted Red and Yellow Beet Salad with Avocado, Oranges, Red Onion and Toasted Pine Nuts. So glad you posted this so I could share it. Hope to see you at Food BlogHer 10 too!